Article from The Daily Wire by James Barrett. After yet another suspected terror attack in which a vehicle was used as a weapon, and fresh off of rolling out a new “knife control” initiative, London Mayor Sadiq Khan is now considering banning cars from some key areas in the city. 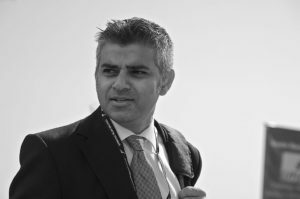 Speaking with BBC radio Wednesday, Khan said he’s looking into prohibiting vehicles in select areas of Parliament Square. While he said he certainly doesn’t want to prevent people from the “important” ability to have “access to parliamentarians” to lobby them, the string of terror attacks in the area involving vehicles is requiring him to look into clamping down on who can drive where. Khan’s car control comments come after a suspected terrorist, a 29-year-old British citizen from Sudan, was arrested Tuesday after driving his Ford Fiesta into a group of pedestrians and cyclists on the sidewalk in Westminster, injuring three before crashing into a barrier outside Parliament. Wouldn’t it be easier to ban the English from London to remove the temptation to Muslims? I would guess hands and feet are next since you can punch or kick someone . Throw the problem citizens out, all of them, families, distant relatives. For everyone that causes a problem, throw out every person related to them. Great Britain ain’t so great with all the stinking refugees. They aren’t adding to the country, they don’t assimilate, send them all back from where they came…massive boatlift. The people of England are what I call “Humaniacs” a combination of human and maniacs. They are sacrificing their culture, their 1,000 year history, and their nation to prove to the world just “accepting” they are as the muslim immigrants destroy everything they have fought for, died for and built. That is the ultimate definition of insanity! How damn stupid can these people be? LET the locals bring their pet PIGS along with them to work and especially when out on the town — eating outside ! IN FACT make it law that all Londoners should own a pet pig as opposed to an AK47 or something so destructive and so unlaidback !!! Yeah, man. Now is your chance to open up your own BBQ restaurant! We have people who will help you start and get financing to open it up. We intend to set up an Oink BBQ beside every Masque in the USA. The Mohamed Pork BBQ has been our best seller. We also feature the 72 Virgins Pork Plate served on a suicide vest. Camel Dung pudding is the favorite desert. On Saturday nights we feature “Run-A-Pig Through A Mosque.” Loads of fun! We also sell specially bred prayer rug eating moths. And at no extra charge you get a PA system with Hip Hop versions of the Muslim call to prayer. Play them all night and watch the fun. We also offer, at a discount of course, an AIDS infected camel or goat to park outside the Mosque. Included with this franchise: one flak jacket and a police type riot shotgun. The goat-humpers are already passing out flyers telling people to keep their dogs out of public places in London. I wonder how much longer they will ALLOW the country to have a ‘Royal Family’? Banning guns,knives and cars will not hurt the terrorist. They drive trunks. You are destroying Londen to placate muslims. They will take london down very soon. Watchout, your about to be a muslim country. Banning people might be a better move, after all cars do not drive themselves, knives do not stab people absent human intervention, nor do guns discharge absent human intervention. Also, absent people, there are no idiotic legislative proposals either. Calling these people animals would be a disservice to animals. UK the new WW2 era Nazi Country. History is repeating itself in the UK but this time the ENEMIES ARE ISLAM. If cars ARE banned, will the bobbies pull a driver from the car and kill them with their nightsticks? They KNOW s/he’s trying to run people down if there’s a CAR involved…I’m making MYSELF laugh!